I am a pumpkin fiend. I love pumpkin baked goods, but I also adore pumpkin soup. A friend of mine is supposed to send me a recipe for pumpkin polenta. Seriously, pumpkin is my favorite food part of fall. I use canned pumpkin sometimes, I do, but last year I learned how easy it is to roast and puree your own pumpkin, and now, it's our post-Halloween tradition. We usually wind up with a few smaller sugar pumpkins on our porch, thanks to trips to the pumpkin patch. I usually can't resist buying a couple from the grocery store, too. These two little pumpkins yielded FIVE cups of pureed goodness. That's five loaves of pumpkin bread right there! 4. Scrape out the stringy part with a spoon. I actually like to use my fingers to remove the seeds first. Then I can remove some of the flesh from the seeds as I go. SAVE THE SEEDS. 5. 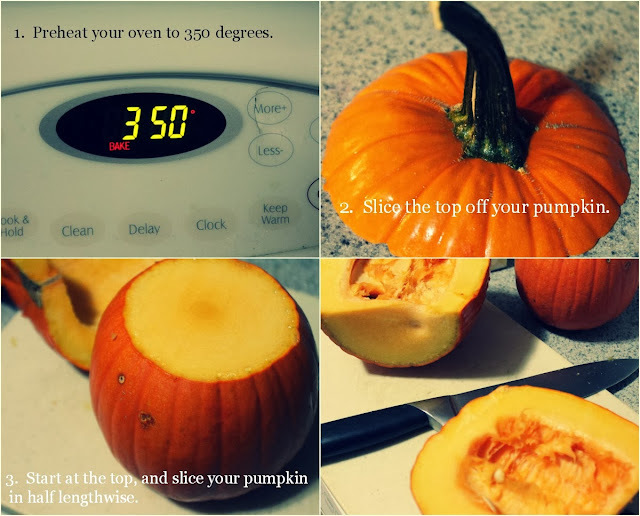 Cut your pumpkin into 4 to 8 pieces, and place the pieces on a baking sheet. Pop in your oven for 45 minutes. 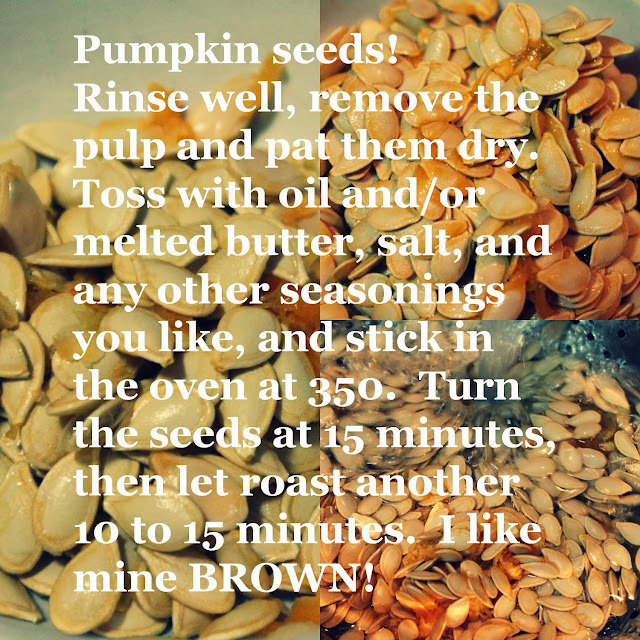 While your pumpkin is baking, you can rinse your pumpkin seeds and dry them well. 6. After the pumpkin is done baking, let it sit until it's cool enough to handle. The skin will be a deeper orange, and the flesh will be tinged with brown. 7. Peel the skin off your pumpkin pieces. You may have to use a butter knife to get it started, but the skin comes off pretty easily! 8. Puree in batches. I use a food processor, some people use a blender. Some people just mash it. I have made three loaves of pumpkin bread and one batch of pumpkin chocolate chip muffins over the past couple of weeks. My goal is to start whipping up pies soon! If you are interested, I have collected quite a few delicious pumpkiny things on my Autumntime pinboard. 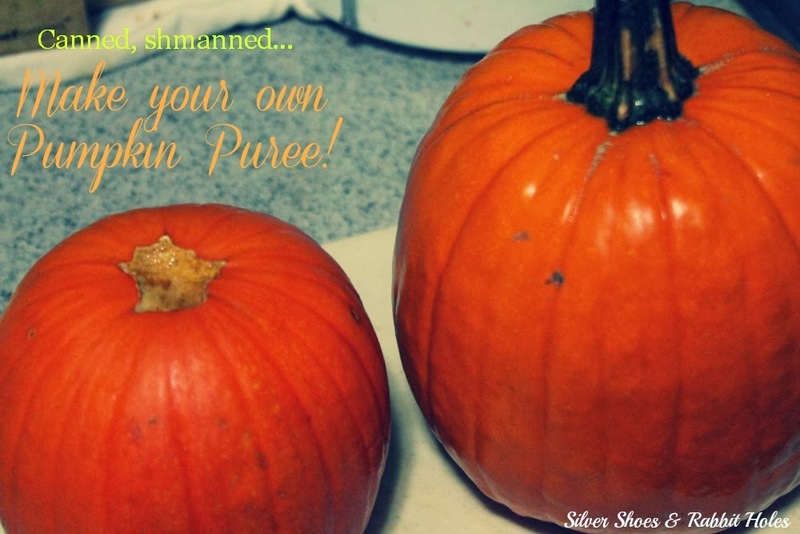 For more fall goodness, you might also check my Thankful and Warm & Snuggly pinboards, too. I have yet to have any pumpkin bread this fall. That's bad, huh? Melissa, it's so easy!!! And pie pumpkins aren't even that hard to cut. My chef's knife needs sharpening, but cutting one of these is much easier than a big pumpkin or a butternut squash. And they scrape clean quickly! 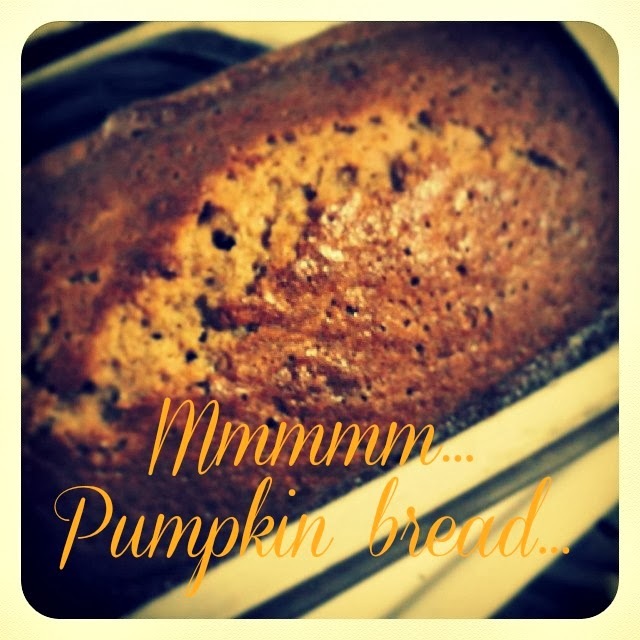 ohhhh that pumpkin bread. I haven't made any yet. or any pumpkin cookies... why oh why??? 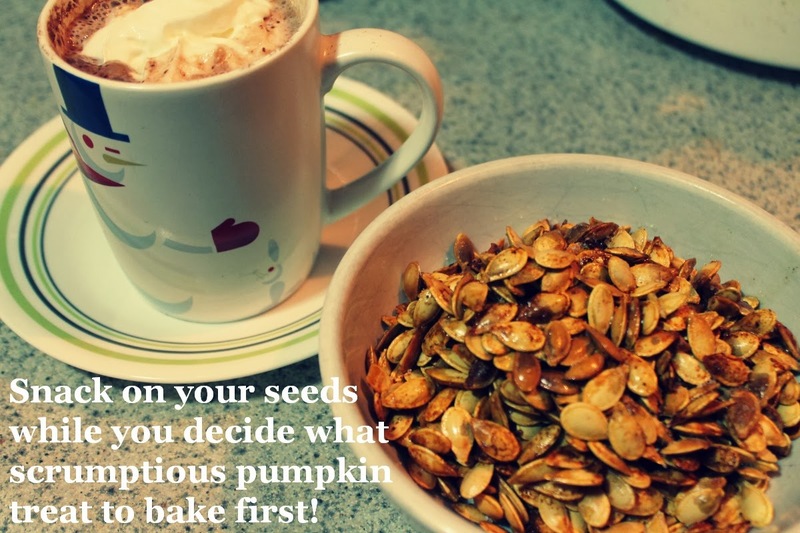 I love pumpkin seeds!!! I want to make my own but not sure I really want to eat pumpkin soup. I mean I tried before but I was not a big fan. I think maybe it was just that particular soup and it was a bit boring. But oh wow, pumpkin bread is something I really want to taste!! !